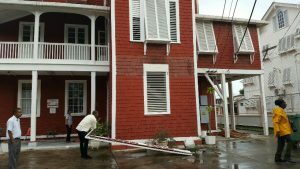 Workers of the Ministry of the Presidency on Friday began stripping Red House of its identity as the Cheddi Jagan Research Centre, even as the High Court has blocked any government representative from entering or removing any item from the building. 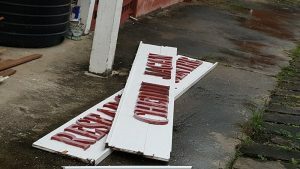 Using a hammer, the workers clawed off the wooden sign stating Cheddi Jagan Research Centre from Red House, High Street, Kingston, Georgetown. Red House is the former residence of then Premier and People’s Progressive Party (PPP) founder-leader, Dr. Cheddi Jagan. Those moves followed an announcement by the Ministry of the Presidency that the lease has been revoked because it was allegedly improperly granted and that the Centre must remove from Red House by December 31, 2016. DUMPED: The Cheddi Jagan Research Centre’s sign dumped at the southern side of the building by Ministry of the Presidency workers. PPP Central Committee member, Indra Chandrapal said workers were inside the building packing up Jagan’s works and artifacts to vacate the premises in light of the announcement and pending legal action filed by former Attorney-General and Minister of Legal Affairs, Anil Nandlall. She said the workers padlocked the gate and said they went to take over the building. “They said they got instructions that nobody must come in and nothing must leave,” she recounted to reporters. Nandlall said the PPP has moved to the court to challenge the revocation of the lease and secured an order restraining the Attorney General, Basil Williams and every other officer of the State or government from evicting or any way interfering with the peaceful and quite occupation and possession of the building and removing any item whatsoever from the building. 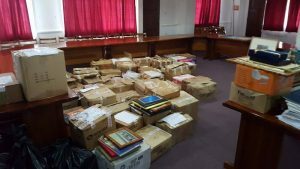 After President David Granger announced the revocation of the lease of Red House to the Cheddi Jagan Research Centre, center volunteers and officials have begun packing up books and other material written by the PPP’s late Founder-Leader, Dr. Cheddi Jagan. Nandlall said Williams argued that the court would be acting in vain because the lease was cancelled several days ago and the State has taken possession of the building over the same period. submissions Nandlall said he rejected before the Judge. “We did not get an order in relation to possession and I believe that is unnecessary because we have never departed from possession so we are maintaining possession of this building and we have an order protecting its content and we believe that is sufficient to protect the status quo.” Nandlall said. The matter comes up again on February 20, 2017 to allow the Attorney General to file an answer within 14 days and time for Nandlall to respond. Opposition Leader Bharrat Jagdeo said the Ministry of the Presidency workers entered the compound and pulled down the Cheddi Jagan Research Institute to demonstrate that the State has already taken possession. “Obviously having misled the court by claiming that they were in possession, they had to show up here this afternoon to take possession by force and that is what they sought to do,” Jagdeo said. A report was made to the police who turned up and interviewed workers of the Ministry of the Presidency who retreated to the opposite side of High Street while the small truck remained parked just outside Red House. The Ministry of the Presidency said the National Trust would be relocated from the Valerie Rodway Building immediately south-east of State House to Red House. The Ministry of the Presidency eventually hopes to create a super-complex by annexing the Valerie Rodway Building and the Walter Roth Museum of Anthropology to State House. The removal of the museum has since been shelved following an outcry by experts and staff , and Amerindian village leaders.